The international search of the south Indian Ocean for missing Malaysia Airlines flight MH370 has been increased with more planes. Eight planes were sent out on Sunday over a wider search area after China released new images of possible debris. Australia is leading the search and said it was investigating sightings of a wooden pallet and other items. Malaysia Airlines flight MH370 disappeared on March 8 en route from Kuala Lumpur to Beijing, with 239 people on board. Based on information received from a satellite, the search has been in two distinct corridors – one stretching to the north-west of the last known location in the Malacca Straits and one to the south-west. However, none of the countries on the northern corridor have reported any radar contact, and two sets of satellite images of possible debris in the south Indian Ocean have concentrated the search there. The search is being co-ordinated by the Australian Maritime Safety Authority (AMSA) from Perth in western Australia. Eight search planes were involved in the search on Sunday, including four civil aircraft and a US P8 Poseidon. Two Chinese IL-76 search planes have arrived in Perth but have not yet been deployed. Japan is sending two P3 Orions. The Australian navy’s HMAS Success is the only ship in the area, though others, including from the US, UK and China are on the way. A key focus on Sunday was the sighting on Saturday of a wooden cargo pallet, along with belts or straps. Pallets are used for shipping as well as plane cargo and Mike Barton cautioned the sighting “could be anything”. AMSA released a statement on Sunday’s search, detailing the aircraft involved and saying the area would cover about 22,800 square miles. Mike Barton said the sun and haze at a low altitude made the task for searchers tough. The weather on Sunday was initially cloudy but it was hoped it might clear later. Earlier, Australian PM Tony Abbott said the sightings of objects were encouraging signs. 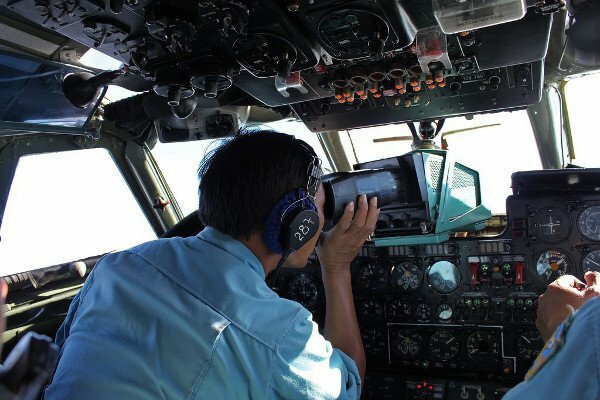 “Obviously we have now had a number of very credible leads and there is increasing hope – no more than hope, no more than hope – that we might be on the road to discovering what did happen to this ill-fated aircraft,” he said. China on Saturday released a satellite image showing an object floating in the southern Indian Ocean near to the area already being searched, some 1,550 miles south-west of Perth. The grainy image was released by China’s State Administration of Science, Technology and Industry for National Defense.